I had to smile when I saw the above in today's Daily Mail. What did I say in my blog on 18th March - 'We Want Proper Crockery'. The Daily Mail agrees, giving examples of food served on shovels, ping-pong bats, iPads, dustbin lids, and inside trainers. There is even a meal in a cap! Join the Twitter account @WeWantPlates - a growing crusade against this trend of serving food on everything but crockery. Take a stand today - The Campaign for Proper Crockery has started! Thanks to the Daily Mail today, it is full steam ahead! 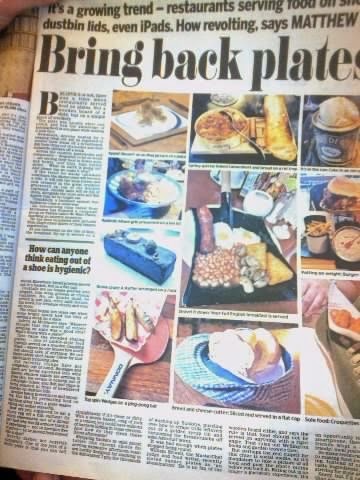 Tonight the BBC's satirical show 'Have I Got News For You' featured the 'Bring Back Plates' campaign by questioning panel members on the range of bizarre items being used for serving food. Well done BBC!